On December 17th in 1941 during the presidency of Dr. Eduardo Santos a budget of $60,000 was destined to build a civil hospital in Florencia. The construction started in 1943 by the architect Eduardo Ferreir and the name "Hospital María Inmaculada" by decree No.2 of April 2nd of 1944. On 11th of November in the same year the headquarters of the hospital were inaugurated. The hospital was clasified in level II by the Ministry of Health, through Resolution No. 14662 of October 29th of 1990. 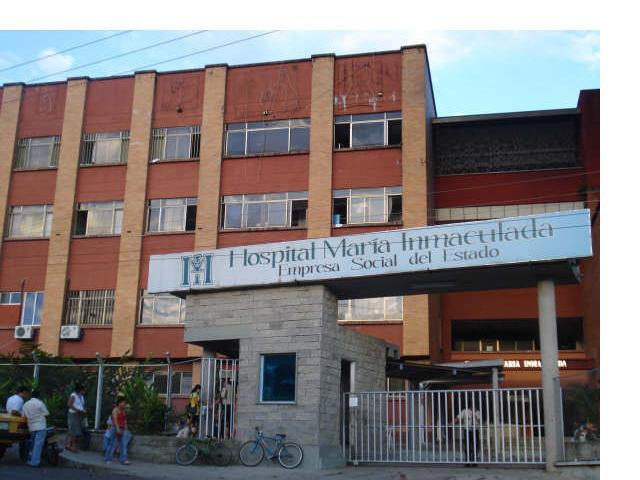 The Departmental Assembly by order 014 of August 5th, 1994 defines "María Inmaculada" hospital as a social state enterprise and due to this fact the preparations began in order to restructure the hospital under the regime of the new law. The hospital offers emergency service 24 hours, vaccination programs, control and growth population, family planning, citology, x-rays, hospitalization, newborn and delivery room, and surgery.